In Ski End, a group of 30-somethings from the city stumble upon an abandoned, flooded-out ski shop, and together, they try to recreate the events that turned the ski shop into the sad, dilapidated eye-sore that it is today. At first, they want to just wander around and flip a few light switches, see if anything still works. Soon, however, they find themselves lost inside the ski shop and take on personas of the shop’s various personalities, including the manager Keith. They also take breaks from waiting for a bus that never comes, skiing around a wet spot in the middle of the floor dubbed “the lake,” and avoiding falling dead birds to do some dissonant musical chanting, standing on a mountaintop-shaped display case. 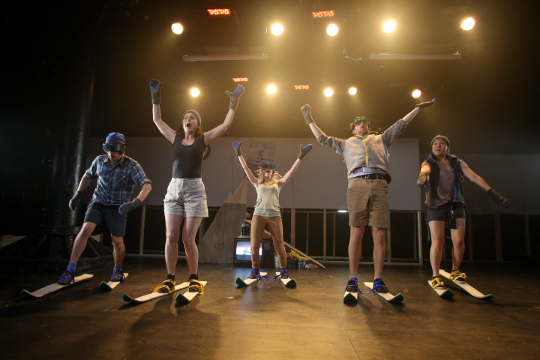 Plus, there is a choreographed dance routine on skis, which is impressive for anyone who has ever worn skis. All in all, it is all standard off-off-Broadway New York theatre weird. The trouble with this kind of weird play is that, for me, it needs to be inhabited with endearing and memorable characters or the story needs to be grounded in some sort of reality. Ski End had one great character. Carla Sagan (played by Alexandra Panzer), the ski shop’s realtor, provided brief moments of comic relief throughout the show. She desperately tries to talk up the shop’s selling points, and at a midpoint in the show, she gives a speech that almost brings everything back from total madness. For a moment, it gave me something to grab onto and think over and care about. That moment is gone too quickly, though, and soon, the focus returns to the 30-somethings and their awkward playacting through the demise of the ski shop. They drink peppermint schnapps-spiked hot chocolate and wait for the inevitable storm. The last-minute introduction of three new characters – local teenagers who have made the ski shop their after-school hangout spot – seems promising but ultimately goes nowhere, and everything wraps up with a string of non-sequitur anecdotes and platitudes. (“We could root out corruption in government,” “We could not be so hard on ourselves about flossing every night,” “One time I visited my high school after I graduated and I felt like such a stranger.”) Meanwhile, the cast dons glow-in-the-dark ponchos and tosses around glowing orbs. Again, it’s all very off-off-Broadway weird. My problems with Ski End really come down to two factors. First, plays that are developed by a collective instead of one or two playwrights are risky. They can end up being a mish-mash of good intentions instead of a unified whole. I like the idea of deconstructing ski culture. The fact that people willingly strap these contraptions to their feet and slide down mountains – risking broken bones or frost bite – is kind of bizarre, and there are some character archetypes like the washed-up former professional skier or snow bunny that would be really fun to explore on stage. Here is where my second problem comes in. Ski End hasn’t found its heart. Not yet. Maybe with more work and soul searching, Piehole will find it, but to me, the show was emotionally detached. Its characters might plead for a better world where people recycle more and the Disney Channel is good again, but without a character I can connect to, Ski End is cold in a way fur coats and cocoa cannot fix.